The St Pancras Renaissance Hotel will open its doors to the public 5 May 2011. Originally the Midland Grand Hotel opened by Queen Victoria 5 May 1873, this stunning Gothic building was nearly demolished several times. Poet Laureate Sir John Betjeman led a protest in the 1960's to save the building. A statue of him stands in the Eurostar rail station next door. Following a £150 million refurbish it has now been beautifully restored to its Victorian glamour. This is one of the smaller staircases. The grand staircase is regarded as the most majestic in England. I'll bring you more in the weeks to come. Good ol' JB!!! Well worth saving in spite of the cost. Wow, this is gorgeous! I can't wait to see more. 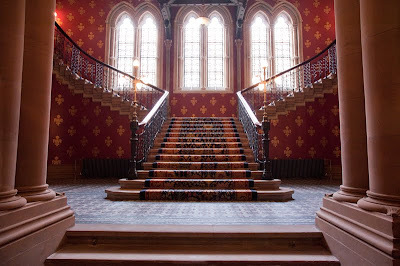 Its grand staircase must be exceptional to beat the staircase in the Foreign Office. Lovely! There are many places that were pulled down in the name of progress & modernism, thank goodness this wasn't one of them! Great shot of a wonderful staircase. I had to deliver there in the early eighties when BT or was it BR, had cables all over the place. In spite of the grime, the decay and lack of care the quality shone through the dank dark walls. That staircase was magnificent then and must be fantastic now! Our heritage is so important! We need to save all of our historic buildings of worth. Yay for Betjeman! What a gorgeous building! I definitely prefer it to 'The Shard'. A SUPERB shot of a very very elegant place! How stunning! I certainly look forward to seeing the rest of your photos of this grand old place. This is a wonderful outcome. The building is so impressive from the outside. The last time I was in London it was surrounded with fencing and looked quite forlorn, but that was during the Eurostar station construction several years ago.